The Boy Scouts of America (BSA) are embracing geospatial technology in a big way at Summit Bechtel Reserve (The Summit) in West Virginia, home of the National Scout Jamboree. Esri ArcGIS was used in the development, design, and construction of The Summit and to provide situational awareness during the 2013 Jamboree. Read the article. Thousands of Boy Scouts also used the mobile ArcGIS app on their smartphones to navigate the sprawling, 10,600-acre site and locate high adventure venues such as zip lines and mountain bike trails. Read the article. 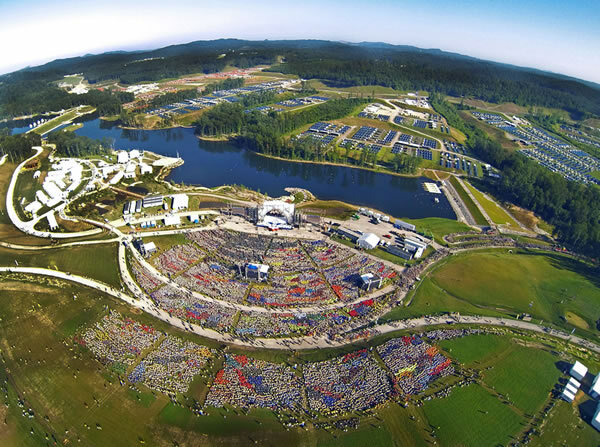 Summit Bechtel Reserve, which hosts the National Scout Jamboree, uses Esri ArcGIS extensively. © 2013 Boy Scouts of America. Learn how to refresh dynamic layers in your ArcGIS web map using a new capability called the refresh interval property, which lets you force an automatic refresh at a specific time interval. Read this tip. ArcWatch is published monthly by Esri and contains GIS news, practical advice, and updates about the company's software and events. To submit article ideas, e-mail editor Carla Wheeler at arcwatch_editor@esri.com. Joshua Perry, an intrepid Cub Scout and budding GIS user, created a web map to track his popcorn and pretzel sales orders using both ArcGIS Online and the Collector for ArcGIS app. Read how he did this, with a little help from his dad. Read the article. You can find geospatial apps and data in the ArcGIS Marketplace. Take a closer look at three apps you can find there, including one that lets you contribute information to a common map. Read the article. Which pirates preyed upon and plundered ships and ports in the Caribbean and Central and South America? View the Esri story map The Real Pirates of the Caribbean to learn about pirates such as Calico Jack Rackham and Edward Teach, a.k.a. Blackbeard. See the Spanish version of the story map. You get your news, videos, and other information online. Now the web is also becoming the go-to place to create maps and apps. 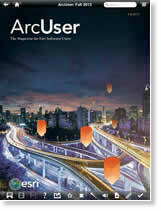 Read this article to learn about Esri's vision for ArcGIS as a cloud-based, online platform. India is creating a national GIS platform that will help decision makers tackle social, health, and economic issues. Read the article. The next version of the Esri Ocean Basemap will separate the basemap's annotation into a reference layer. Read this blog for details and see the beta version. The Esri president receives the 2013 Champions of the Earth Award at a United Nations ceremony in New York. Read the article. The Geospatial Information Infrastructure (GII) supplies geospatial data and application services for United States Department of Homeland Security missions. Read the article. Though the worst seems over, New South Wales, Australia, continues to cope with wildfires. View the Australian Wildfires Map from Esri to see the locations of wildfires and warnings. Want to find innovative solutions that incorporate geodesign to plan sustainable and resilient cities? Sign up for the Geodesign Summit, January 29–30, 2014. Find out how easy it is to use ArcGIS Online to share data collected with ArcPad. You can make web maps to share in ArcGIS apps that run on iPhones, Android smartphones, Windows Phones, and a variety of tablets. Watch the video. Esri education manager Joseph Kerski blogs for Green 360, a careers website for high school and college students. As a Green Guru, he writes about the use of geospatial technologies in green jobs in fields such as recycling, renewable energy, and pollution reduction. Read the article. MIL-STD-2525C or APP-6(B) using the Military Features template from Esri. Read the blog for details. Watch this video workshop to find out how to integrate real time-data feeds into your web applications using ArcGIS GeoEvent Processer for Server. Learn how to get started using this new mobile app to collect data for use with the ArcGIS platform. The World Topographic Map was recently updated through the Community Maps Program with new content from the Czech Republic along with Las Vegas, Nevada, and more than a half dozen other American cities and counties. Read the blog. Read this blog to learn about Google Maps Engine Connector for ArcGIS. 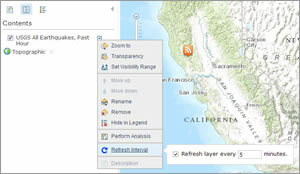 Users can use it to access Google Maps Engine content within ArcGIS for Desktop. What's in Store for Delaware's Trails? The State of Delaware created this story map to explain in maps, text, and photos a plan to create a network of paths and trails for hiking, biking, and horseback riding. The American Society for the Prevention of Cruelty to Animals (ASPCA) uses GIS to study where problems such as animal cruelty and abandonment are acute. Listen to the podcast. Whether you are commuting on a train, waiting for a flight, or hanging out at home, if you have an Internet connection you can learn a new ArcGIS skill. View the web courses. Esri updated the World Imagery map with more than 30 terabytes of high-resolution imagery from DigitalGlobe. Included is imagery of Bamako, Mali, one of the fastest-growing cities in the world. Read the blog. Jill Boughton, president and CEO of W2Worth Innovations, talks about why location is important in converting waste into a profitable resource. Listen to the podcast. Watch this video to see a proof of concept that uses a dynamic QR code to communicate map information from a presenter's screen to mobile devices. Take ArcNews and ArcUser with you on your iPad or Android tablet. Download the Esri Bookstore mobile app from the Apple App Store or Google Play to access current issues of both Esri magazines. View content such as maps, embedded video, and podcasts. 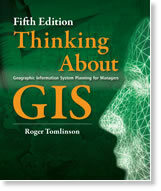 In Thinking About GIS, Roger Tomlinson—known as the "father of GIS"—helps managers determine the data and technology their organization will need. The new edition examines current tech trends and includes a video of his planning seminar. Buy the book today. A new release of Data Appliance for ArcGIS is available to US customers. Manufactured by Cutting Edge for Esri, Data Appliance for ArcGIS is a solution with content similar to ArcGIS Online services but deployed behind your firewall.